1. One wolf in the pack (usually the alpha wolf) will start a howling session by pointing it's nose towards the sky and howling, and the other members of the pack will soon join in excitedly. Each pack member howls on it's own note. 2. Wolves communicate mainly in three ways; visual signals, including facial expressions, vocalization, and scent marking. 3. Isle Royale, a small island north of the upper peninsula of Michigan in Lake Superior, boasts the largest number of wolves and moose per square mile in the world. 4. Gray wolves are protected under the Endangered Species Act as a threatened species in Minnesota and as an endangered species in the lower 48 states. 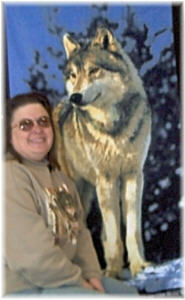 Wolf populations number 5,900 to 7,200 in Alaska and are not considered endangered or threatened in this territory. 5.Play is much more common among wolves than aggressive behavior. Restrained bites and wrestling are normal wolf play patterns. 7.Wolves are descendants of an ancestor called a "Creodont, which lived about 100 million years ago. This carnivore is common to all modern carnivores, including cats, dogs, and bears. 8.A wolf pack (on average) usually eats the equivalent of one deer each week (One caribou equals about two deer, and one moose equals about six deer). 9.Today,European wolves can be found in the mountainous regions of Spain, Portugal, and Italy, and in Poland, Romania, Czechoslovakis, Bulgaria, Albania, Greece, Turkey, Finland, and the former Yugoslavia. 10. There is no need for man, and no demand for man, in nature, it is complete with him. - William Graham Sumner.